If you have never read any of the No. 1 Ladies Detective Agency novels then you must remedy that! They are delightful! 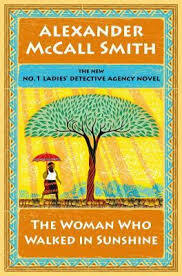 In this 16th installment it is decided, against her will, that Mma Ramotswe needs a holiday. Grace is to be the head detective while she is away and Charlie and Mr. Polopetsi are enlisted to help her. Mma Ramotswe doesn't know how to relax, and she is now at loose ends while on holiday. Only a couple of days in and Mr. Polopetsi comes to her with concerns about Grace's ability to handle their newest case. Through twists and turns everything works out as it always does through politeness and concern for others' feelings. I love Mma Ramotswe's logic in dealing with people, she has a wisdom that shows she cares deeply for her clients as well as for her friends. And even though Grace can be grating she has a good heart and she proves herself to also have the ability to handle cases on her own. I enjoyed every bit of this book!